Religion as defined to be a set of beliefs, cause, or principle held to with ardor and faith by a group of people,have been a major issue of concern in the world as many believes in different gods, others in one creator of the universe who they call different names and some believe in same creator who they call a particular name, which is believed to be the real name of the creator of the whole universe. One of the religions that believes and teaches much on the true name and worship of the creator of the universe is the YAHWEH YAHSHUA SYNAGOGUE whose day of worship is on the 7th day as part of keeping the commandments of the Yahweh Yahshua. 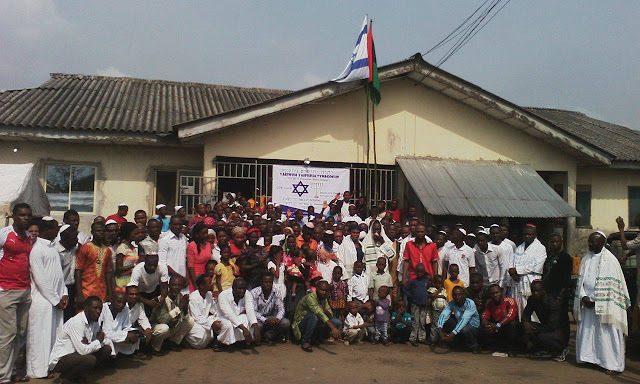 The fast growing religion in Biafra Land can be traced back to originate from Israel nation who has undisputable connection with Biafra Land. On 18th March 2017; the Yahweh Yahshua Synagogue (also known as Yisraelites Biafra religion) in Igweocha, raised the Biafra flag alongside the Israeli flag in the synagogue. In an interview with Family Writers' correspondent, Elder Yacob Ell (the rabbi) revealed why they officially raised the flag in the synagogue and it's significance; excerpt: "the flag signifies our nation Biafra and as a nation, Biafra has converted many to be good in all aspects of life and has undoubtedly changed people's way of life for the better, which is acceptable by Chukwu Okike Abiama hence, Biafra is a religion". Speaking further on the issue of the official raising of Biafra flag in the synagogue, one of the rabbis Mrs. Ell Nwachukwu said, "the flag signifies who they are as the Israelites known as Biafrans in Africa". When asked why the Leader of the indigenous People of Biafra, Mazi Nnamdi Kanu covers himself with same attire which they use on different occasions and during his appearance in court; She briefly explained, "Nnamdi Kanu is a dedicated believer and worshipper of Yahweh Yahshua, he also keeps the Holy Commandment of Chukwu Okike Abiama by worshipping on the 7th day of the week being Saturday even in detention". Commenting on the issue of continuous incarceration of Nnamdi Kanu despite court orders and calls which demanded for his release; she said "The Nigeria government don't really know what they are doing by holding this servant of Yahweh Yahshua, I urge them to release him, apologize to him and repent in order to avert the punishment of Yahweh". 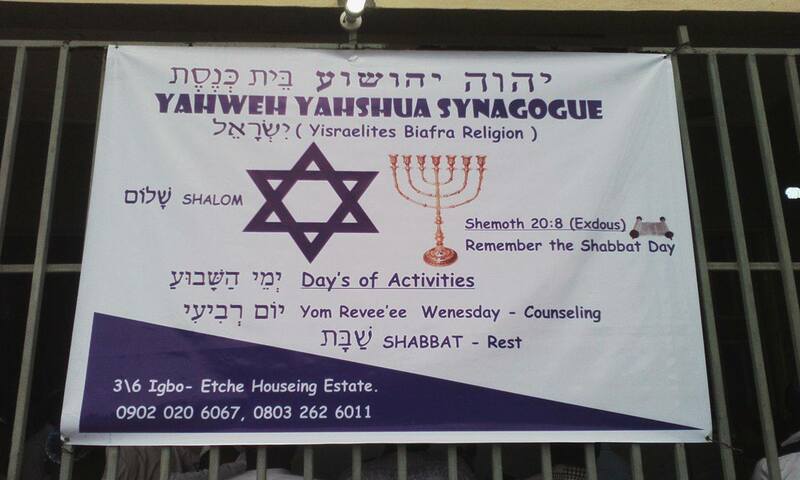 "As far as Yahweh Yahshua lives, Nnamdi Kanu must be released from incarceration and Biafra must be restored" she added. After delivering teachings of the day, which included the benefits of knowing the true creator of the universe, his real name and keeping His Holy commandments, the Rabbis admonished Biafrans to embrace Yahweh Yahshua (popularly known as Chukwu Okike Abiama), worship Him in spirit and in truth and by so doing, the restoration of Biafra will be faster than expected. "Shalaa and Iseee", re-echoed from the congregation at the end of the Rabbi's speech which means 'So be it'.